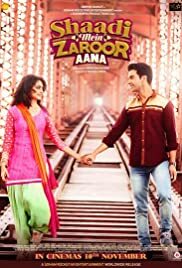 Shaadi Mein Zaroor Aana is a 2017 Indian romantic drama film directed by Ratnaa Sinha. The film stars Rajkumar Rao, and Kriti Kharbanda in the lead roles. The movie is produced by Vinod Bachchan and presented by Deepak Mukut and Soham Rockstar Entertainment.Aarti, a bright, ambitious woman, is on the cusp of making a great career for herself. She agrees to marry Satyendar, but flees the arrangement when she learns she will not be allowed to work once they are wed.